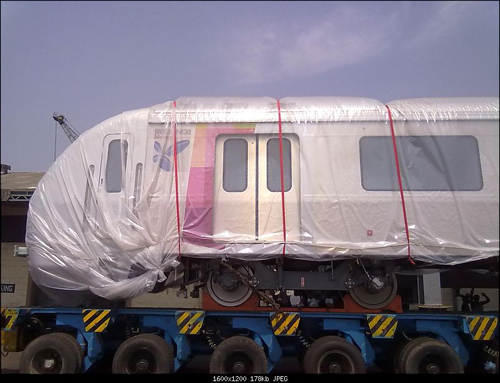 Future metro rail cars in Mumbai. Photo via team-bhp.com. According to Parisar, an environmental organization that works on sustainable development with a focus on urban transport, India is expected to spend 40 billion dollars in metro rail over the next 10 years. The proposed metro rail system for Pune (and other cities) has been the subject of a heated debate, given its cost and what many people see as poor integration with existing transportation. In India, only two major cities, Kolkata and Delhi, have metro rail but a number of other urban centers are in the process of building metros, including Ahmedabad, which will have a project linking to Gandhinagar, Gujarat. Bangalore and Mumbai are in the process of building rail systems. The cities of Kochi, Jaipur and Luhiana have also proposed systems. The transparency and accountability of governance systems involved in all aspects of metro rail systems – from deciding to have a metro all the way through to its construction and operation. The treatment of metro rail systems as stand-alone systems rather than being a part of the larger urban transport system. The lack of attention to planning that integrates land-use and metro rail systems, for better catchment, access, integration etc. The lack of consideration of the impact of metro rail systems on the urban fabric including its environment, its architecture and its cultural identity and heritage. Professor Dinesh Mohan from the Transportation Research and Injury Prevention Programme outlined his reasoning behind developing non-metro rail modes of transit in India. He thinks that metro rail promotes urban sprawl by enabling people to live farther from cities and pointed out that metro systems do not save time when factoring in door-to-door transport, for typical travel distances of six to seven kilometers. Instead he says that safe, pedestrian and bike-friendly cities with affordable public transportation resolve congestion. He also mentioned that Indian cities are structured differently than European cities, which tend to have well-defined central business districts that employ large working class populations. Another key point is that city-specific plans are necessary, not a one-size-fits-all prescription based just on city size and population. Participants at the conference also stressed that cities “must have a development plan and a comprehensive mobility vision and based on systematic and thorough studies.” They said that plans and projects should be open to meaningful evaluation and include stakeholders and actors from regions, not simply a single city. Bangalore is currently building 40 kilometers of metro rail. The planning and proposal process has been slowed by a lack of transparency, including no Environmental Impact Assessment before the project was finalized. A gap between proposals for projects and actual performance signifies the concerns with Delhi’s rail system. Proposals state that metro rail trains would move 3 million users per day, which was later reduced to 2.2 million; and today, only 1 million people use the trains, despite cuts in bus routes and increased bus fares. About 200,000 families were displaced for the construction of the metro but only 50,000 have been resettled. Hyderabad’s metro rail, a private sector development, was described as being one-sided, in favor of the developer. Many viewed the proposed routes as cutting through culturally rich sections of the city. Participants felt that a metro rail system in Kochi was impractical, given that the ferry system is in need of improvements and there are existing suburban railway lines and bus systems that are under-utilized. Kochi supports a relatively small population of 600,000 people. Mumbai has a metro rail system currently in the works, but the development process has been rife with controversy such as legality of land acquisitions, cost escalation with less than desired results, such as above-ground lines as opposed to below-ground infrastructure, as well as questions of timeliness and construction safety. Pune’s proposed system has been characterized as poorly planned and ambiguously understood on a number of levels. There has been limited citizen involvement in the project, the metro system is poorly integrated with other transport networks, planners have a limited understanding of local issues, and the metro system will significantly impact the landmarks of the city. A full summary of the discussions are available here. For many in India, metro is a last resort and should not replace multi-modal and integrated transport plans. Given the history of metro rail projects, plans should involve the public and be highly transparent. All construction should be evaluated for environmental and social impacts. Rather than heavily invest in one form of transit, conference attendees suggested improving pedestrian conditions and existing networks. What do you think? In a city that needs as much public transportation as possible to accommodate its massive growth, what solutions are the most effective?